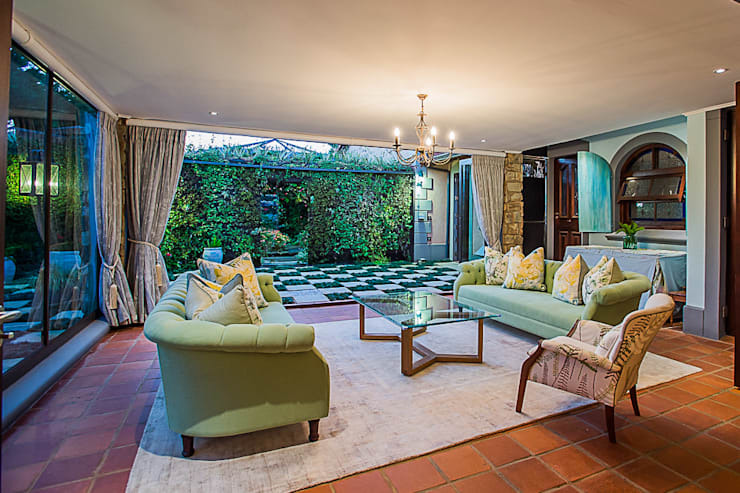 Today we are going to travel to Hillcrest in KwaZulu-Natal where design professionals House of Decor have created the most lavish interiors that you will ever see. As we explore the interior rooms of this house, we will learn just how perfectly functionality and style can work together as well as explore how different colours, tones and textures work together. 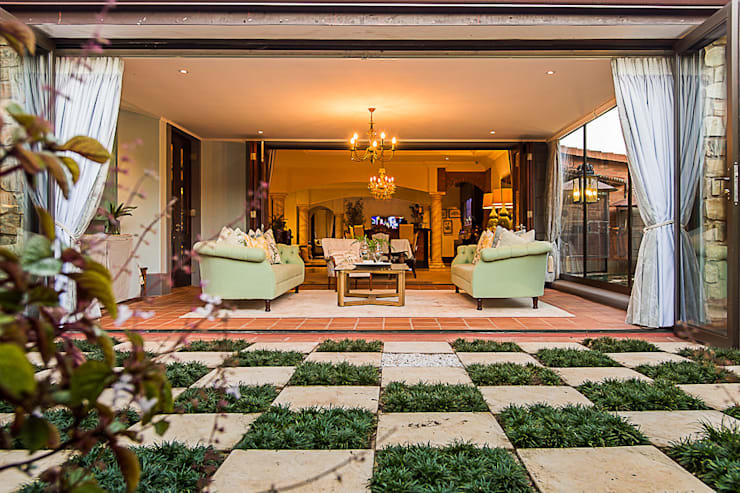 With a theme of Tuscan nights , this beautiful family home is also perfectly designed for the South African climate. Are you ready to learn some design tricks and tips today? In this image, we can see how the living room of the home spills out onto the gorgeous terrace. This creates a wonderful interaction of interior and exterior spaces. The terrace is a unique feature in itself with its combination of large, sandy beige tiles and patches of grass. The living room features mint-coloured sofas, an intricate wooden coffee table and a very lavish chandelier, creating an area that is very appealing both functionally and aesthetically. Don't you love the living room floors, which are made up of warm-toned ceramic tiles? If we look at the living room a bit more closely, we can see how the cushions on the sofa as well as a rogue armchair bring a unique set of patterns and colours to the space. A plush rug adds the homeliness and comfort of the room. We can also see how the large glass sliding doors, which open up to connect the interior and exterior spaces, also feature curtains. This allows the family privacy and shade if need be. Don't you love the vertical garden outside? Have a look at these tips for creating and planting a vertical garden. 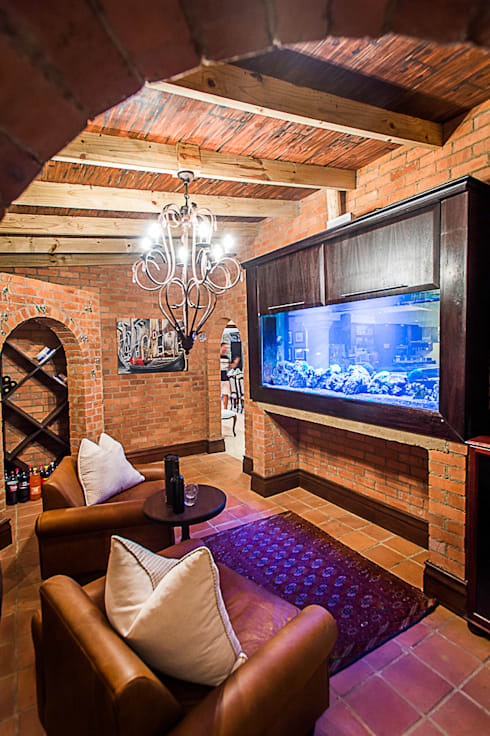 In this area of the home, we come across a more casual living area complete with a fish tank and a wine cellar! Because this is a more cozy space, the designers have gone for natural and rustic colours and materials including brick walls and wooden ceiling beams. The warmth of this space is enhanced by the brown leather armchairs and patterned rugs. Again we can see how lighting has been used not just for functional purposes but to bring elegance and beauty to the interior space. Want a wine cellar in your home? Have a look at these tips and tricks for storing wine at home. On the other side of the fish tank, we come across a television room! With its tan leather sofas and plush cushions, this is the perfect area for relaxing with a good book or enjoying your favourite film. In this space, we can see how its the little details that make a huge difference. Two pot plants flank the television, bringing a gorgeous and natural touch to the interior environment. The television cabinet keeps remote controls, decoders and other items stored neatly out of sight. Tip: Add an aquarium to your home for a wonderful sense of tranquility. This bedroom is a wonderful example of how serene and tranquil this space should be. The designers have gone for soft, neutral tones that enhance the peacefulness of the environment. The white linen and beige tones are perfect for a private oasis like this. 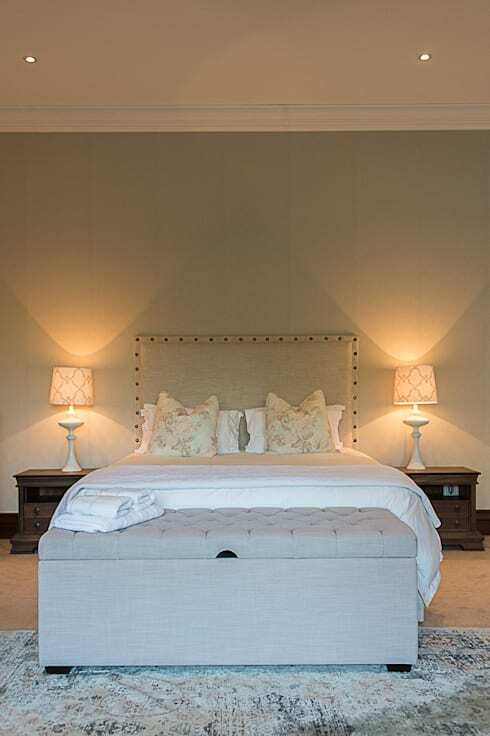 The lampshades next to the bed give this space a wonderful, soft glow and perhaps a little bit of romance too! We have to end our tour looking at the lavish swimming pool and garden area. This is a space that has been truly utilised. 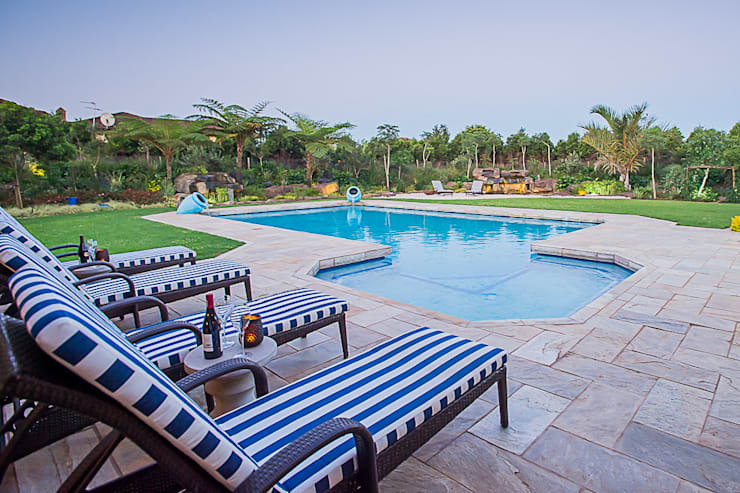 The large swimming pool works in harmony with the expansive garden, while a tiled area creates the perfect exterior space for relaxing in the sunshine, playing games or hosting outdoor events. The sun loungers with their nautically themed striped cushions are the perfect functional and stylish addition to this exterior area. If you've enjoyed this home, you'll love these 9 South African living rooms to get inspired by.